Poor Sissy is huge pregnant and apparently was taken with milk fever. Her body wasn't getting enough nutrients and calcium to support the babies, her milk, and herself. The babies and milk get priority, so Sissy was down. We started with calcium, but I don't think we were doing enough the first couple of days. 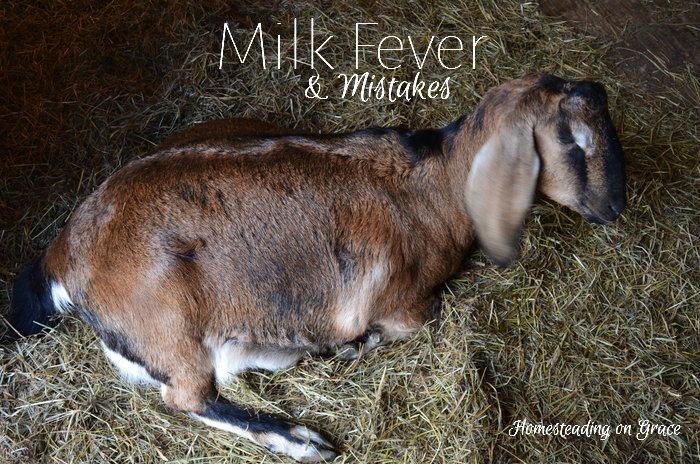 We did 50 CCs of MOF (a calcium, magnesium, phosphorous, potassium mix) twice a day for two days, but it only seemed to be keeping her from getting worse. We were able to slowly wean off the calcium drench, lessening one per day, and we'll probably continue with one drench per day until she kids. We don't want her to regress. This has made me look into our feeding schedule. I've always been slightly confused about what to feed them because it never felt like everyone was very clear. I'd like to have a measured recipe, but then I guess goats are more like people and need some variety. We've been feeding them All-Stock and oats. We were under the impression that those were the important ingredients for their health, and that hay was not, I guess because you buy those and so they have to have what the goats need, right? Kind of like dog food? Dangit. I'm so glad we caught it though and are now making it right. I've been reading this book but had not gotten to the feed section yet. Well, I read through it last night, and along with quite a bit of patient explaining from my friend Lesa, I finally get it. I think. So goats are browsers and need more than the feed mill feed. In fact, most of the time they need very little feed mill feed. The grains need to be balanced out by the hay. Alfalfa is almost too strong of a hay for goats because it tilts the boat in the other direction. Right now we're doing some alfalfa pellets to balance out the lack of hay. (They have grass hay too. But we've done so much grain that we need a drastic rebalancing.) They don't love the alfalfa but are eating it. We'll lessen the alfalfa again once they kid. The other possible cause of this is the fact that this is Sissy's first kidding, and it looks like she's having more than one, and possibly three. At least, that's what our goat lady says. That's a lot of babies on Sissy's body! We'll see how many come out in a few days. This whole thing was so incredibly stressful for me. I was worried that we were going to mess up so bad that we could lose her. But God helped, I think, and didn't let us mess up so bad. It's funny, though, I don't feel like He healed our goat, but more like gave the grace for us to have enough time to do it ourselves. Almost like a test to see if we can hack it in the animal husbandry. I hope we pass, He wants us to do well. And we want to do well too. We're going to really revamp our feeding in the next few weeks, slowly over time to get them on the best possible schedule and recipe. I'm reading the Natural Goat Care book carefully and studying exactly what they need. We'll get there. I think we have her back up to a good enough place to give birth, but she's lost a lot of weight and I am worried about what birth will do for her. We're making sure she's getting plenty of food during the day. I'd love to get a little more weight back on her before birth. But we are running out of time. The due date is Sunday, so technically it could be anytime. Did your stress level just quadruple? Mine did. I'm so glad you were able to get meaningful help for your goat. The learning process can get scary when animals you care about and count on are affected. We live in a mid-sized city and have a large vegetable garden. We will be getting ducks soon to raise as layers for my son's 4-H project and because we have a family member who is allergic to chicken eggs. My biggest stress with this is that I will make a mistake and not care well enough for the ducks and they will suffer. My son has special needs and cannot be completely responsible for animals without a lot of supervision. He wouldn't harm them, but needs someone to keep him on task. I think I could have made it as a homesteader, but my husband has a very bad back and I, now in later middle age, am not as strong as I used to be. Keep up the faith and the hard work! I enjoy reading about your process and progress. Thank you Allison! I hope you do get your ducks, it's definitely a learning curve with livestock. On the one hand, you are dependent on them for something (eggs, milk), but on the other hand they are dependent on you for care keeping. It's a different relationship, but so worth it. I am glad she pulled through. Our second year raising sheep, we had some ewes break out of their pen and get into a whole lot of oats. We had four go down while pregnant. Thankfully with the vets help, we were able to save them. 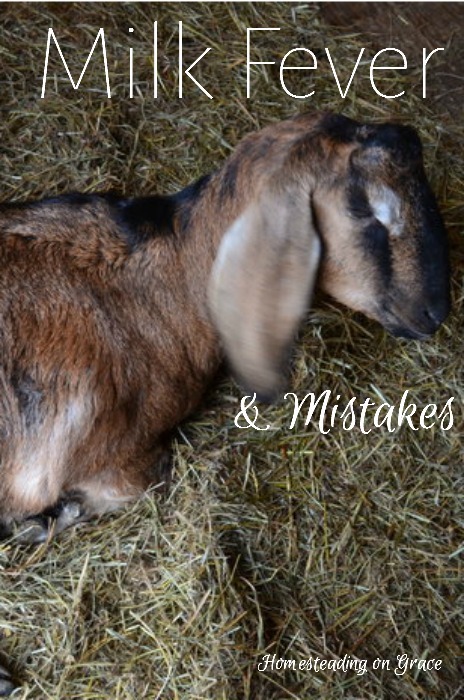 raising livestock can be stressful! Thankfully there is usually someone that is willing to help in those situations. Thank you Sandra! I was definitely stressed, and I'm hoping our kidding goes well too. Four sheep doing this would have scared me to death! Hi there! I'm visiting from The Art of Home-Making Mondays. I'm so glad you were able to save Sissy. The Lord is good. :) What a beautiful girl. I hope all goes well at kidding time. Can't wait to see the babies. I'm so glad she's doing better! Goats have had such a big learning curve for me too. Jennifer, Please be careful feeding pregnant does alfalfa in the 3rd trimester. I have had alot of experience Painful experience with this issue. What worked for me was to have a protein pail 20% or higher, and no minerals added available 24/7. And breaking the total daily nutrition for each doe fed in small quantities 2 or 3 meals throughout the day. Also High quality grass hay available at all times. This gives them the ability to eat when their body requires energy. I hope all goes well. Thank you Wendy! I'll keep the protein pail in mind. We actually saved her using the alfalfa this time. She needed the calcium to combat how much grain we had been feeding her. We've gotten her leveled out now, and are being much more diligent about keeping hay available and letting them graze on green. They are doing so much better now.